I wonder whose exact anniversary it was commissioned for in 2014? It was shown at the Big E fair in Springfield, MA as part of a 50th anniversary salute to the Fair. They flew me in to talk about the Fair. The guy had a stunning collection. Was he the one who had it commissioned? Yes, Michael (last name escapes me this moment) had it made for that event. That's him in the hat with his hand on it in one shot. I still regret not going to the Eastern States Exhibition when you were there (it's right in my backyard). Unfortunately, I didn't know of Bill Cotter or this forum until earlier this year. 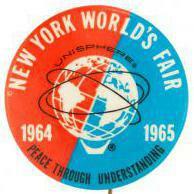 What possessed someone in Mass to commission a Unisphere, when New York really didn't do much to honor the 1964-1965 Fair? I take it the museum on site didn't want it? The guy had enjoyed the Fair as a kid (sound familiar?) and decided to hold a birthday party. No clue as to post-event negotiations.